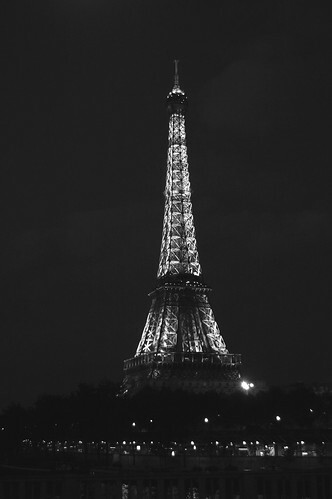 Today, it's exactly 120 years ago the Eiffel Tower was opened to the public! All is well... here... and there. We just got a letter in the mail from our little girl. A short, happy note! With a lot of exclamation marks and smileys and hearts - the barometer for happiness. We did have news from our kids every day, though. The school signed up for a voice mail service. Every night a group of about 4 or 5 kids recorded a message for the parents, with a short description of the day. Very cute, to hear all those happy voices, the giggling, the "je vous embrasse très fort"... Last night we heard M. - finally! little H. had started crying a couple of nights before because her sister hadn't been on there yet. She sounded cheerful and happy. It made us happy too. One more night and they're back. A big night for them, though, as tonight will be party night - the much anticipated "boum"!! Though I missed my biggest little girl tremendously, I had a very nice and peaceful week with my other little one. H. has been extremely calm and sweet this week. No tantrums, no yelling... She didn't have to keep up with her sister or compete to get all the attention she wants. After school we stayed at the park (if it didn't rain...) so she could play with her friends. We prepared dinner together a couple of times - she sitting on the counter chattering and me cutting vegetables, that is. And on Wednesday afternoon we went to the Louvre. I didn't plan anything special for Wednesday afternoon (forgot to plan a playdate - shame on me). So a bit desperate about what we could do, I asked her if she fancied going to the museum. To my surprise she said yes! Since they are learning about Egypt right now, the choice was easily made: the permanent exhibit on ancient Egypt. Mummies and sarcophagi! Right before we left she asked if she could take her sister's camera. She wanted to take pictures for the class. Man, she was so cute with that little camera! You should have seen her: framing, stepping back and forward to position well, doing it over when not satisfied. She turned a smile on quite a few faces that afternoon! She determined the pace and we were through in about an hour. I still need to download and print out the 66 pictures she made... (could it be she caught mommy's bug?) I think we definitely need to get her a small camera for her next birthday.